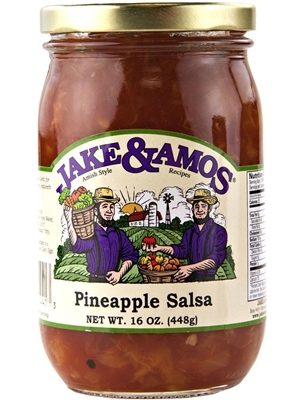 Jake and Amos Pineapple Salsa has a sweet hint of pineapple and a spicy burst of jalapeños for a sweet and spicy salsa. Try this salsa at your next party or picnic for a refreshing twist on an old favorite. Ingredients: Tomatoes, Sugar, Pineapple, Onions, Tomato Paste, Water, Vinegar, Salt, Citric Acid, Garlic*, Jalapeno Peppers*, Seasonings (*dry).